Tectonic shifts at plate boundaries can result in earthquakes, volcanoes or both. There is one other type of area that can lead to the creation of volcanoes, and these are known as hotspots. There are a number of hotspots all over the world. Hotspots occur when one of the Earth’s plates moves over an unusually hot part of the Earth’s mantle. These hot areas are usually relatively stationary and result in large amounts of magma rising up, piercing a hole in the plate to form a volcano. As the plates move, a series of volcanoes can form. This is how the Galapagos Islands were formed. 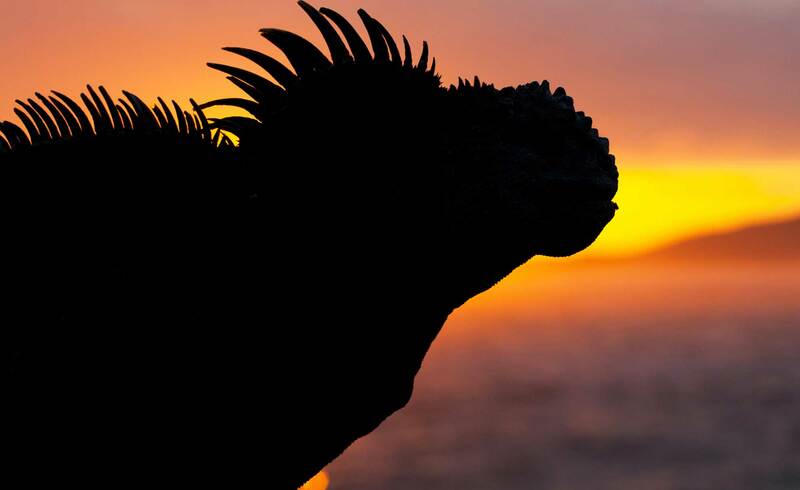 The Galapagos hotspot (estimated to be around 150km wide) is located to the west of the Galapagos Archipelago. The Islands are located in the northern part of the Nazca plate, which is slowly drifting in a southeasterly direction at a rate of approximately 5cm per year. 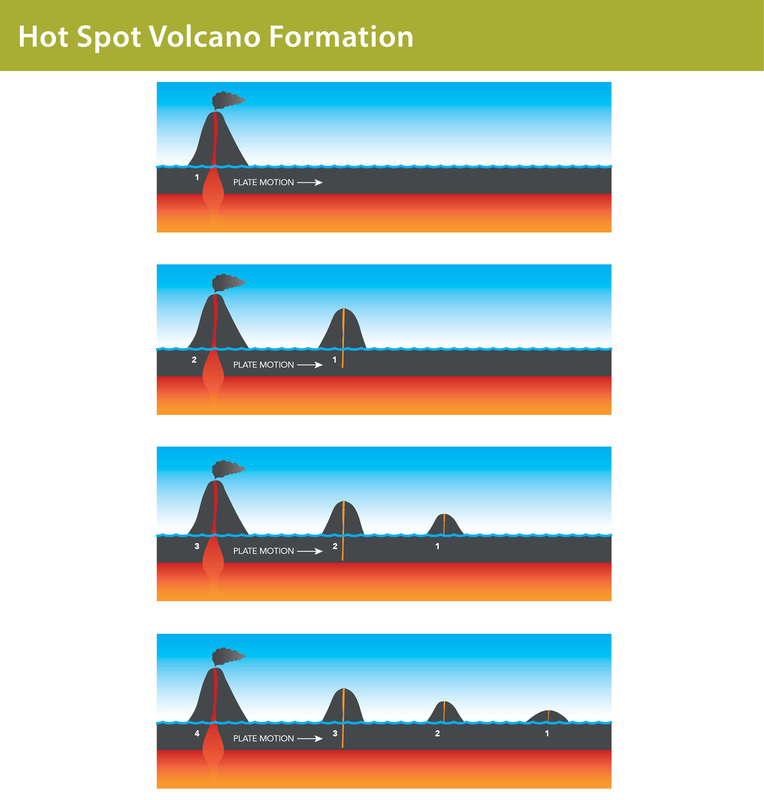 As the plate moves, the hot spot remains stationary and islands form and slowly drift away from the hot spot allowing more volcanoes and islands to be formed. The islands that are furthest from the hotspot are the oldest while those closest to the hotspot are the youngest (most recently formed). 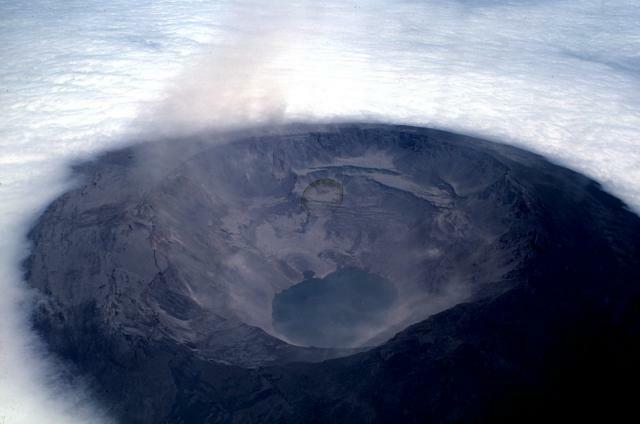 San Cristobal is approximately 4 million years old, while Fernandina is thought to be less than 700,000 years old, and considered to have one of the most active volcanoes in the world. The movement of the Nazca plate in this direction causes it to collide with the South American plate. As the South American plate is continental it means the Nazca oceanic plate (which is heavier) is forced below. As this happens, and the plate is forced into the mantle, it begins to melt. Magma makes its way to the surface where it forms a volcano, ejecting molten magma known as lava. The Nazca plate is close to the Cocos plate (north), the Pacific plate (west), the South American plate (east) and the Antarctic plate (south). A single volcano formed each of the islands apart from Isabela (the largest island) which is actually formed from the joining of six different volcanoes. The newly forming islands in Galapagos are in the north west of the area. Because these volcanoes are formed underwater, the lava spreads out across the sea floor spreading out. This means the islands are formed with gentle sloping sides and a main vent. 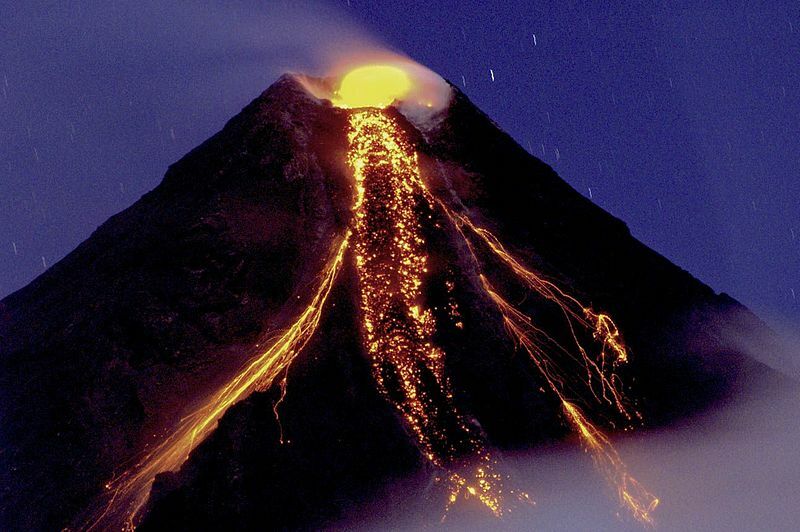 This type of volcano is called a shield volcano. Shield volcano: a shield volcano has a very shallow slope as the lava has low viscosity (it is very runny and not very sticky). Composite cone volcano: a cone shaped volcano formed by many layers of lava, tephra (larger pieces of volcanic material), pumice, and volcanic ash. In the last 200 years there have been over 50 eruptions from volcanoes in the Galapagos Islands. This shows that the volcanoes are still active and the islands themselves are still forming. The most recent significant eruption was on Fernandina island in 2009. Often on Fernandina and Isabela you can see columns of steam and gas coming out of the volcanoes. Most of the Galapagos Islands are formed from basalt which is a type of rock formed from basaltic lava. Basaltic lava is much more fluid than other types of lava and is usually from oceanic crust. This means it flows further and producers a much gentler slope on the volcano. This is how a shield volcano is formed. Many volcanoes have a caldera at the top. A caldera is a large circular depression where a volcanic crater would have originally been. As magma is no longer supplied to the crater (as the island moves away from the hotspot) it leaves a large open cavity. The largest caldera in the islands is on Isabela and is around 7 x 10 km.